Just finished cleaning up from a trip out to the shoals today. Dad and I went off in search of Christmas dinner, and got more than we expected. We left the ramp about 4am, at which we were quite surprised to see it getting busy already, and headed off down the channel. It was a little lumpy and uncomfortable, but with the forecast for things to improve as the day went on, we continued steadily out. However, we did decided to take a look at some closer shoals and slowly make our way further out as conditions improved. 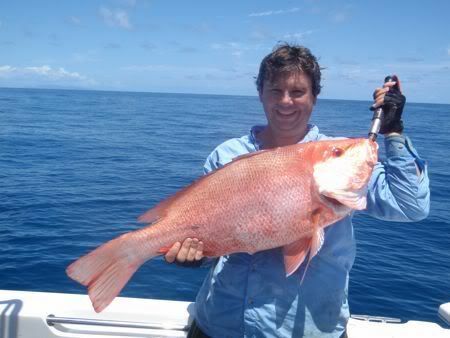 I am going to keep things short as I fish for dinner to prepare. But we ended up bagging 7 doggie mackerel to 2kg, 2 nice Nannygai including one thumper 7kg specimen and 3 Cobia. We also landed several Trevalley and lose a few good fish too. But that big Nannygai is designated Christmas lunch. Mackerel were taken on a variety of baits and metal slices. But most of the other fish we taken on whole pillies. 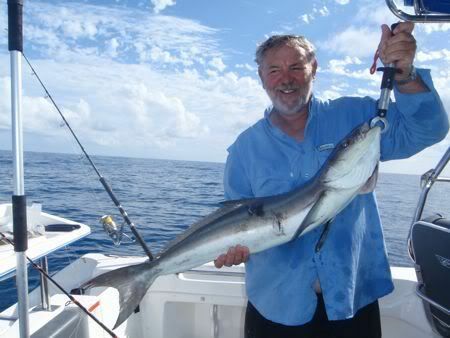 The Cobia were very cool, coming right up under the boat in small school or 3 or 4. Just 2 pics today as we were so busy all morning.